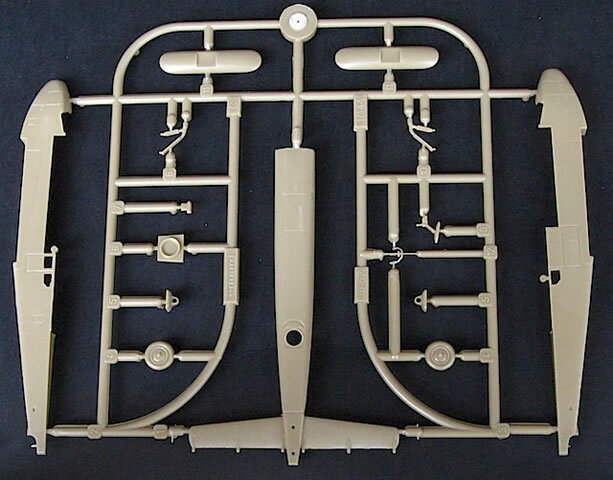 47 olive plastic parts (7 unused); 11clear plastic parts (3 unused); 1 decal sheet with markings for 4 aircraft; 2 page full colour instruction booklet. 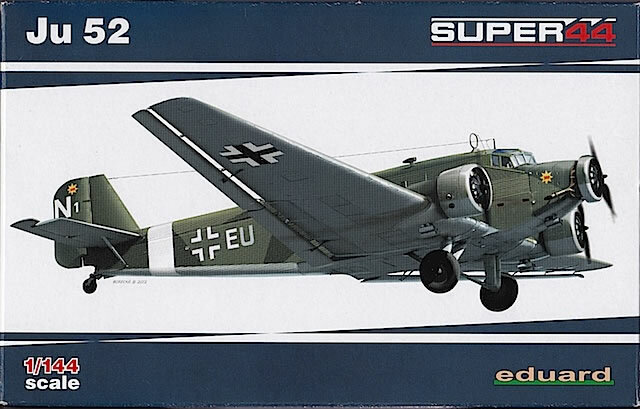 Now marketed under the ‘Super44’ label, Eduard’s range of 1/144 kits continues to grow. The well received Me 262 kits of five or so years ago were joined in 2011-12 by an equally popular MiG-21 family. 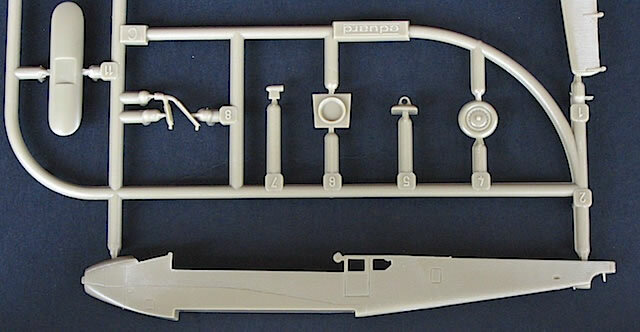 A Spitfire Mk IX series has just been launched (more on this in the near future) as well as new editions of Eduard’s 1/144 Ju 52 kits, which were first released a decade ago. Eduard’s original Ju 52 lineup included minesweeper, float and ski-equipped aircraft. So far only an airliner version and the ‘standard’ military Ju 52/3m kit being reviewed here have been released this time around, although with the promise of more to come. 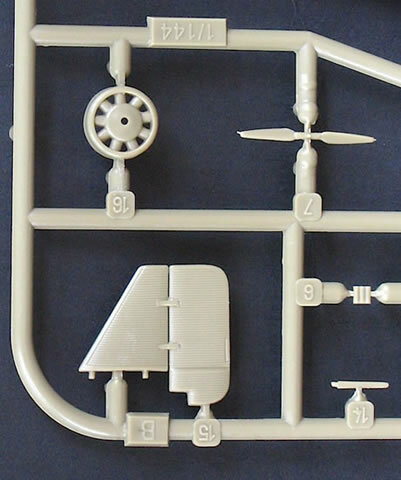 Eduard’s 1/144 Ju 52 kit comes in a small (but not tiny) end-opening box, with Weekend Edition-style artwork on the front and starboard profiles of the kit’s marking options on the back. Inside are three sprues of coloured and one of clear plastic, one sheet of pre-cut canopy and window masks, and a 12-page instruction booklet with a full colour painting and marking guide. Overall, the feel is closer to a Profipack than Weekend Edition boxing – minus the photo-etched details, which Eduard has decided to sell separately for these kits. The plastic parts look very good. 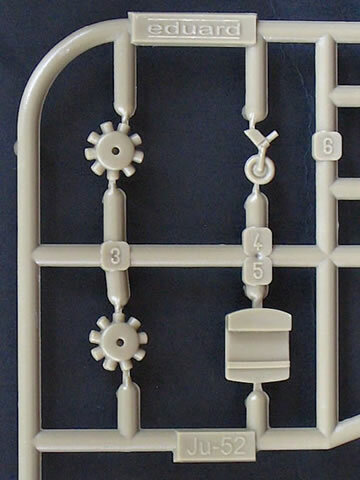 There are a few clues that hint towards ten-year old moulds – a little flash, and a slight chunkiness to some of the smaller parts – but overall quality is excellent. The distinctive Junkers ‘corrugations’ on the fuselage and wings are beautifully captured. Eduard has made a decent attempt at an interior, including an instrument panel decal, pilots’ seats, bulkheads and an internal fuselage floor. This is enough to give viewers the impression that something’s there, while providing a good platform for anyone wanting to add further detail. 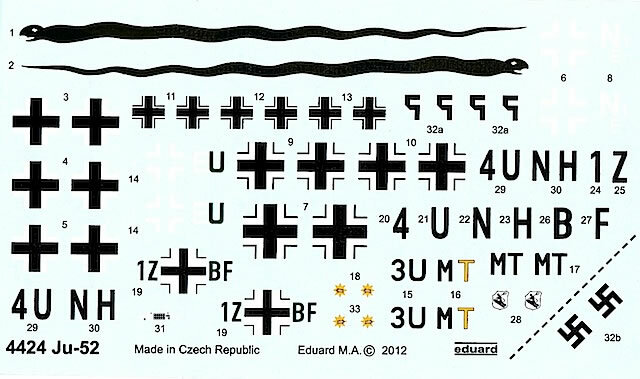 And for those who do, Eduard is releasing dedicated photo-etched sets for both military and civilian versions of the kit. 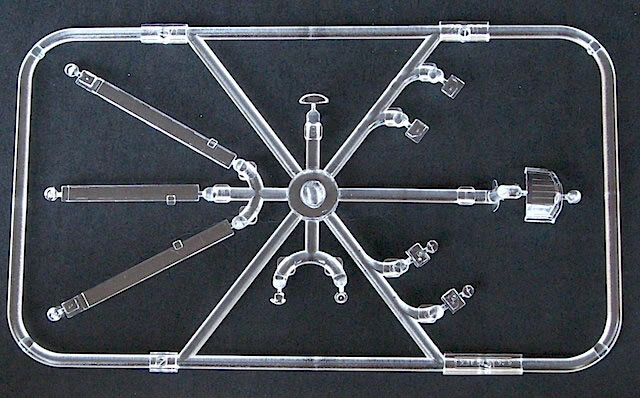 The clear parts also look good, although I haven’t tested their fit. The pre-cut masks will make painting much easier, but you will need tweezers, a steady hand and lots of patience to get them all in the correct location. Fortunately, Eduard’s placement guide is very clear. 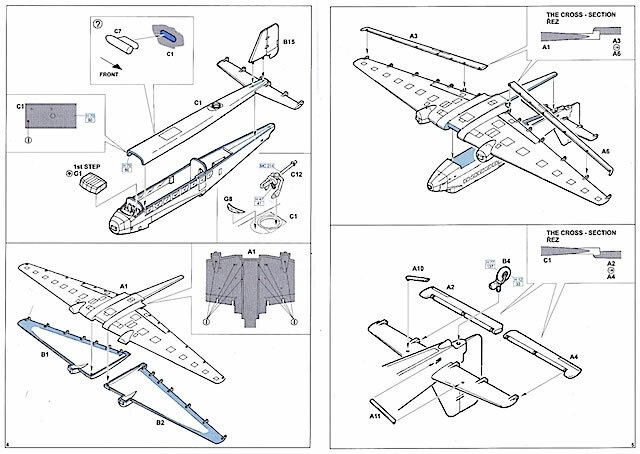 Kit assembly is also clearly explained, with eight well-illustrated steps leaving little room for misinterpretation. 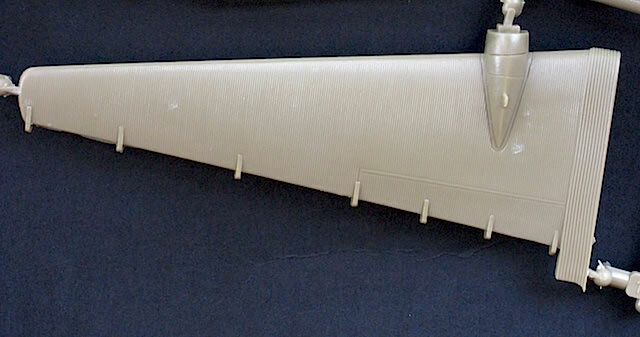 Again, patience will be required because a couple of steps look slightly fiddly: care will be needed in aligning the fuselage spine and attaching the control surfaces, and test fitting is recommended. 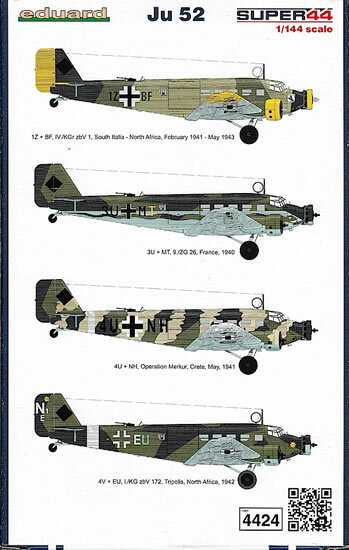 Luftwaffe Ju 52s were finished in a diverse range of camouflage schemes, and Eduard has chosen a representative selection of aircraft for the kit’s marking options. A. ‘4V+EU’ of I./KG z.b.V.172, based at Tripoli, north Africa in 1942. This aircraft was finished in standard RLM 70 Black Green and RLM 71 Dark Green over RLM 65 Light Blue, with a white theatre identification band on the rear fuselage. C.	‘1Z+BF’ of IV./KG z.b.V.1, based in north Africa and southern Italy, February 1941 – May 1943. ‘1Z+BF’ was also finished in a variation of 70/71/65: this time the upper surface greens were overpainted with large splinters of RLM 02 Grey. Additional colour is provided by the RLM 04 Yellow rudder, engine cowlings and underwing tips. 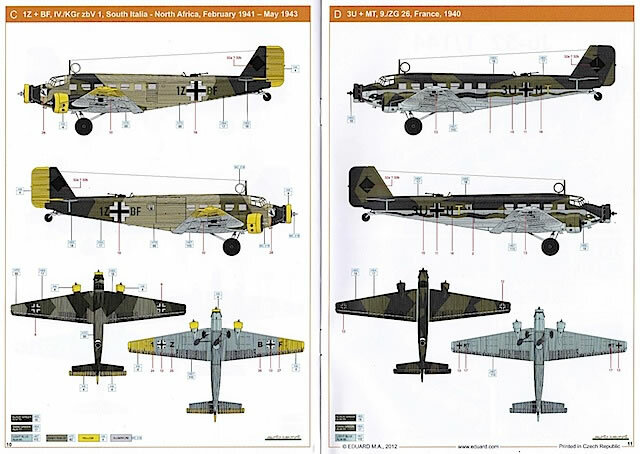 This aircraft also featured on a recent 1/48 AIMS decal sheet, the instructions for which pointed out that, due to a lack of definitive photographs, the upper surface colour delineations can’t be known with any precision. Nonetheless, a model finished in this scheme would be very striking. Speaking of the decals, they have been produced by Eduard and look very good on the sheet, with crisp printing, good colours and no obvious flaws. 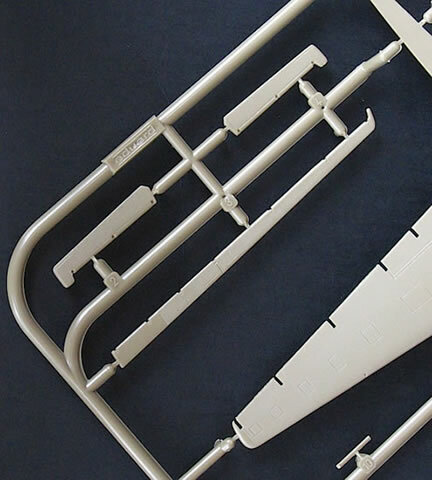 This appears to be a very good little kit – although even in 1/144, the Ju 52 isn’t a tiny aircraft. 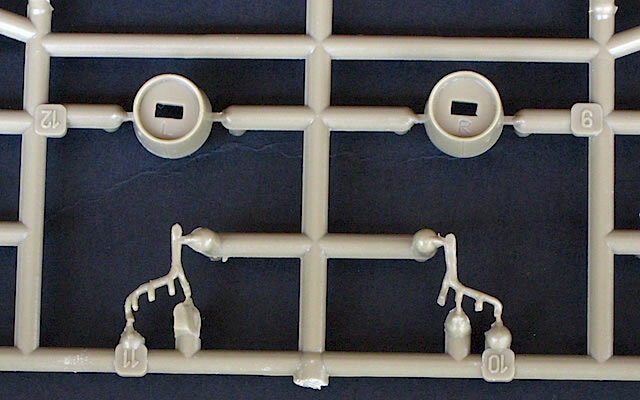 The original moulds have held up well, and Eduard’s reboxing is an appealing overall package that encourages you to start building right away. I’m holding out for now, but I’m pretty sure I’ll be building this one before I touch my 1/48 Revell kit.